Escambia High School in Pensacola was on lockdown for several hours today as deputies search for a grand theft auto suspect that ran onto the school campus. Deputies attempted to make contact with the subject in the 6800 block of Stonehenge Circle, which is near the school, as he was standing by a vehicle that had been reported stolen earlier in the day. The suspect fled on foot and deputies gave chase. The suspect ran onto school campus and blended in with the students who were performing a fire drill exercise. He was later found by school employees walking in a hallway of the school. The suspect was arrested and charged with disruption of a school function and resisting arrest without violence, both misdemeanors. The name of the suspect has not been released due to his age. Felony charges may also be filed against the suspect for the stolen car as the investigation continues, deputies said. Deputies did not believe the suspect was armed. Multiple charges have been filed against a Pensacola man who shot his girlfriend in the face this morning during an argument. 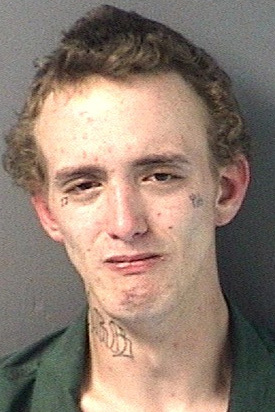 Henry Blackmon, 21, of 4823 Sierra Drive, Pensacola, was charged with attempted murder, assault, possession of a weapon by a convicted felon, vehicle theft, fleeing/eluding police, and driving with a suspended license. The incident occurred around 2:30 a.m. at Blount Street and Watson Drive. The 23-year-old victim was driving a vehicle when she and Blackmon got into an argument. Blackmon then shot her in the face, pushed her out of the car and fled the scene, Pensacola Police said. The victim used her cell phone to call 911. As police were responding to the area, Officer David Rogers saw the vehicle westbound on Cervantes Street. Officers Rogers and Coy McKenna followed the vehicle with emergency lights and sirens activated to “X” and Cervantes streets where Rogers intentionally collided with the suspect’s vehicle in an effort to stop it. No one was injured during the collision but a chain link fence was damaged during the impact. The female victim was taken to a local hospital for treatment of non-life threatening injuries. Her name has not been released . Molino native and Tate High grad Dusty Sanderson’s first four songs and his first music video — filmed in Escambia County — have been released. Sanderson, 20, signed with Lamon Records and recorded his four-song EP at Quad Studios in Nashville with Grammy nominated producer Dave Moody. 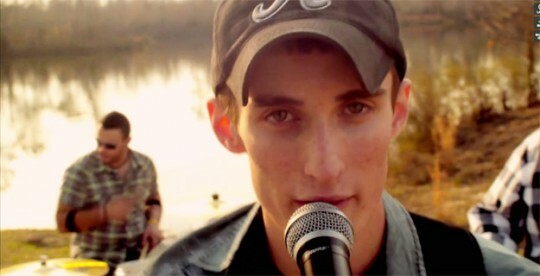 His first music video for the title track “Chuggin’ Along” was shot January 24 in Bluff Springs, including a bonfire scene that featured a lot of his friends around a bonfire enjoying the song. Additional scenes were filmed earlier in the day at Chan’s on Nine Mile Road. The first single “Chuggin’ Along” has just shipped to country radio stations across the nation. The four-song album highlights Dusty’s songwriting abilities, and in addition to the title cut, it includes “Dang Good Country Song,” “Country to the Stone,” and the ballad “This Old Guitar”. “I’m still overwhelmed. It’s just crazy how fast a childhood dream can turn into a reality if you work hard enough for it,” Sanderson told NorthEscambia.com. Asked about his songwriting, Sanderson said, “I’ve been interested in writing songs all my life, but I didn’t get serious about it until I was 17. I had a girlfriend that I spent all day, every day with, so when she took a trip to LA for a week I had no clue what to do with my time, so I sat down in my room and started writing.” And he’s not stopped since. “Chuggin’ Along” and Dusty Sanderson’s complete four song EP release are available from iTunes and Amazon.com. 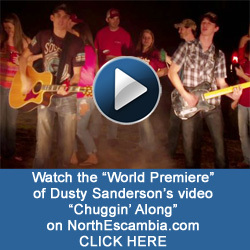 To watch the “World Premiere” of Sanderson’s video “Chuggin’ Along” on NorthEscambia.com, click here. The Dusty Sanderson band will open for the Kentucky Headhunters on Saturday, March 16 at Beulahfest. 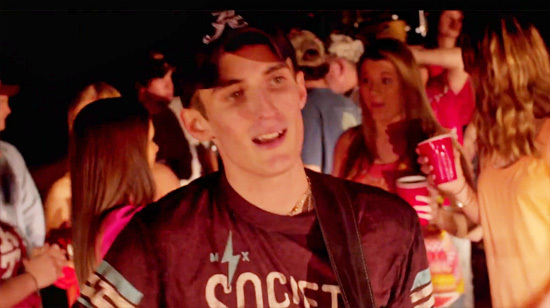 Pictured: Scenes from Dusty Sanderson’s video “Chuggin’ Along” that was filmed partially in Bluff Springs, just off Highway 29 in North Escambia. Courtesy images for NorthEscambia.com, click to enlarge. An Escambia County woman has been convicted of animal cruelty for duct-taping her dog’s injured eye, State Attorney Bill Eddins said Wednesday. Mechele Renea Potter, 46, was convicted Tuesday by an Escambia County jury and sentenced by Judge Thomas E. Johnson to 300 days in the Escambia County Jail along with all fines and costs. 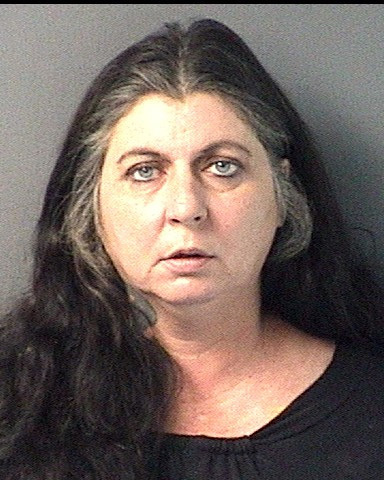 On September 18, 2012, Potter called Escambia County Animal Control to report a stray dog in her yard with duct tape on its head, according to the State Attorney’s Office. The dog was not a stray but instead was actually owned by Potter. a result, the dog’s eye had to be removed. While the cause of the injury was unknown, the injury was made worse by the defendant’s failure to seek medical attention, the State Attorney’s Office said. Potter testified that she tried everything she could before calling animal control, which consisted of using the duct tape and calling some vets. Her husband also testified, stating that he told her to lie to animal control about owning the dog, and that he helped her put the tape on the dog’s head, prosecutors said. The dog has since been adopted by a family. Today is the final day to pay real estate and personal property taxes and receive a one percent discount, according to Escambia County Tax Collector Janet Holley. made on the tax collector website by midnight February 28. Steve Mattox, age 61, of Cantonment, passed away Tuesday, February 26, 2013. Steve was a native of California and resided in Pensacola most of his life where he graduated from Woodham High School, attended Pensacola Junior College and received his Bachelor’s Degree from the University of West Florida. He was retired from Solutia after 14 years. Steve loved hunting, the outdoors and his John Deere tractor. He was of the Assembly of God faith. Preceding Steve in death are his father, Dan M. Mattox; mother, Helen Loraine (Hazelbaker) Mattox; father-in-law, Edward Beasley, and sister-in-law, Kathy Beasley. Survivors include his loving wife of 34 years, Karen (Beasley) Mattox; mother-in-law, Irma Beasley; loving aunts, uncles and caring cousins. Visitation will be Friday, March 1, 2013, from 6 p.m. until 8 p.m. at Pensacola Memorial Gardens Funeral Home. Funeral services will be at 10 a.m. Saturday, March 2, 2013 at the Pensacola Memorial Gardens Funeral Home. Special thanks to the doctors, nurses and staff of Woodlands, West Florida Hospital and Covenant Hospice at West Florida. James R. “Jimmy” Wright, age 72, of Cantonment, passed away on February 25, 2013, at The Villas in Gulf Breeze. Jimmy was a member of Gonzalez Baptist Church in Gonzalez, FL and retired from Monsanto (Solutia) after 41 years of service. He was a graduate of Tate High School. Jimmy passed away from complications of Alzheimer’s Disease. He was born in Bonifay, FL and lived in Cantonment all his life. He coached Little League football and baseball in his early years and loved sports and fishing most of all. He also loved woodworking and playing his harmonica. He was preceded in death by his parents, Claude and Nolda Wright and one son, Scott Allen Wright. He is survived by his wife of 51 years, Brenda, and their three daughters, Sherrie Cahoon (Jodie) of Tallahassee, Vickie Wright (Brian Caton), and Deitri Dorion (Mike) of Cantonment & Pensacola; five grandchildren, Desta and Scott Cahoon of Tallahassee, Kayla, Mallory and Lily Dorion of Cantonment; two sisters, Pat Benson (Jim) of Clarksville, GA and Claudette White (Hugh) of Warrenton, MO; two brothers, Ronnie Wright (Gina) of Robertsdale and Mike Wright (Linda) of Alexandria, LA; as well as several nieces and nephews and extended family. Visitation will be on Thursday, February 28, 2013, from 1 p.m. until 2 p.m. at Faith Chapel Funeral Home North with services starting at 2 p.m. with Brother Roy Chewning officiating. The family wishes to thank the staff and caregivers of The Villas and Covenant Hospice who so lovingly took care of Jimmy during his stay there along with his special caregivers at Creekside Senior Living. Donations in Jimmy’s honor can be made to Covenant House, Gonzalez Baptist Church, The Alzheimer’s Foundation or a charity of your choice . Faith Chapel Funeral Home North is in charge of arrangements. Kindergarten registration for Escambia County students will begin Monday, March 11. Students who will be five years old on or before September 1, 2013, are eligible to register for the 2013-2014 school year. Registration will occur at the school which serves the student’s housing area. For additional information, contact the elementary school which serves the student’s housing area. 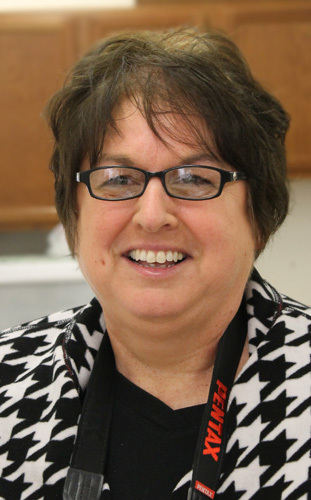 Sherri Stallworth has been named the Teacher of the Year at Ernest Ward Middle School. Stallworth serves as the school’s media specialist, and also coordinates the production of the Ernest Ward Middle School yearbook “The Talon”. NorthEscambia.com photo, click to enlarge. Qualified patients would be able to posses and use medical marijuana for treatment of certain conditions, as long as they have a registry ID card from state officials, under a bill filed Wednesday by a Senate Democrat. The measure (SB 1250) also would allow for licensed medical canabis farms and dispensaries. Under the bill, filed by Sen. Jeff Clemens, D-Lake Worth, the maximum amount of medical pot a patient or caregiver could possess would be 4 ounces of dried medical canabis or eight pot plants, though state officials could change those amounts through the rulemaking process. The measure, named for Cathy Jordan, who suffers from ALS or Lou Gehrig’s disease, comes a day after Manatee County sheriff’s officials said they raided Jordan’s home and seized 23 marijuana plants. A sheriff’s spokesman said the raid came after a real estate agent alleged Jordan was using a neighboring property’s electricity, and had nothing to do with the planned filing of the bill named for her.